The Hague, 29 June 2017 — The Board of Europa Nostra, the leading heritage organisation in Europe, made a statement about the Ancient city of Hasankeyf and its surroundings in Turkey, listed among the 7 Most Endangered heritage sites in Europe in 2016, following a nomination by the Cultural Awareness Foundation. In their statement, the Board of Europa Nostra deeply deplores the decision of the Turkish government to build a dam that would lead to the flooding of a site of world significance, without proper and transparent justification and without adequate compensation measures. In particular, the Board regrets that the removal of the Zeynel Bay Tomb has been carried out with insufficient consultation with the local and scholarly communities and that other Islamic monuments of great significance remain highly endangered. The Board of Europa Nostra urges the Turkish authorities to adhere to the standards of heritage protection that are included in the European Conventions and to set up a proper consultation process with local communities and civil society organisations concerned in an open and transparent manner. The Board of Europa Nostra, meeting on 14 May 2017 in the framework of the Europa Nostra’s European Heritage Congress in Turku, Finland, was advised that the longstanding intention of the Turkish Government to move the Zeynel Bay Tomb, a monument featuring Timurid tradition, has now been completed, as part of the ongoing government project to build a dam that will lead to the flooding of the archaeologically and architecturally important site of Hasankeyf on the river Tigris. It is to be regretted that this removal has been carried out without sufficient documentation having been provided and certainly with insufficient consultation either with the local or with the scholarly community, both of which believe that the value of the site of Hasankeyf is far greater than the benefits to be obtained by its flooding. It is to be even more regretted that other Islamic monuments of great significance including the medieval bridge of the 12th century of the Artukid dynasty, the 15th century mosque complex and tomb of the Ayyubid Sultan Süleyman and the Imam Abdullah tomb, remain at risk. For all these reasons, Hasankeyf was included on its 2016 List of 7 Most Endangered sites in Europe, as part of the programme run by Europa Nostra in partnership with the EIB Institute and the Council of Europe Development Bank. The Europa Nostra Board also deplores the fact that the law recently passed by the Turkish Grand National Assembly overrules the decision taken by the Turkish courts in 2013 that the relevant Environmental Impact Assessment Report was inadequate. 1) The foreseen flooding of Hasankeyf would destroy evidence for one of the oldest organised human settlements ever discovered. Such a site is not just of national and European but of world significance. Therefore, we believe that it is incumbent not only on Turkey but on the entire international community to ensure its safeguard. 2) Hasankeyf possesses one of the richest treasures of Islamic monuments in any country member of the Council of Europe. Acknowledging and affirming the value of this heritage for Europe’s shared cultural heritage, we deeply deplore the decision of the government of Turkey, a Member State of the Council of Europe, to build a dam which would lead to the flooding of such a site and, as a consequence, to the loss of one of the most valuable witnesses of Islamic heritage in a European country, without proper and transparent justification and without adequate compensation measures. 3) We urge the Turkish authorities to adhere to the principles and standards of heritage protection which are included in the European Conventions adopted under the auspices of the Council of Europe and of which Turkey is a signatory (namely the Granada Convention and the Valletta Convention). We also make a strong appeal to the Turkish authorities to set up a proper consultation process with local communities and civil society organisations concerned in an open and transparent manner. It is by now very late but applying best international practice to this case of outstanding but endangered heritage could still be beneficial. Europa Nostra is the pan-European federation of heritage NGOs which is also supported by a wide network of public bodies, private companies and individuals. Covering more than 40 countries in Europe, Europa Nostra is the voice of civil society committed to safeguarding and promoting Europe’s cultural and natural heritage. Maestro Plácido Domingo is the President of the organisation. Founded in 1963, Europa Nostra is today recognised as the most representative heritage network in Europe. 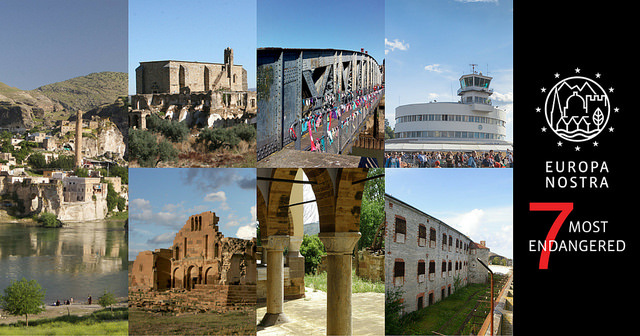 We campaign to save Europe's endangered monuments, sites and landscapes, in particular through the 7 Most Endangered programme. We celebrate excellence through the EU Prize for Cultural Heritage / Europa Nostra Awards. We also contribute to the formulation and implementation of European strategies and policies related to heritage, through a structured dialogue with European Institutions and the coordination of the European Heritage Alliance 3.3. Hasankeyf Matters was formed in Istanbul in 2012 with the goal of consolidating information about Hasankeyf, its history and its potential for economic development. With volunteers based in Hasankeyf as well Istanbul, Hasankeyf Matters has organised twice-yearly “ingatherings” in Hasankeyf to attract visitors and showcase elements of traditional life (e.g. gardening, herding, fishing, foraging) that could serve as the foundation for commercial services for tourists. Hasankeyf Matters partnered with The Initiative to Keep Hasankeyf Alive and the Cultural Awareness Foundation (a Turkish NGO) in the successful nomination of Hasankeyf for the 7 Most Endangered programme run by Europa Nostra in partnership with the European Investment Bank Institute and with the support of the Creative Europe programme of the European Union. A small town with a great heritage, Hasankeyf already attracts about 500.000 visitors each year, a number expected to rise. Given its historical, architectural and economic significance for the region, public opinion supports its preservation. The area was declared a First Degree Archaeological Site by Turkey’s Supreme Board of Monuments in 1978 and has been under the protection of the Culture Ministry’s General Directorate of Antiquities and Museums since 1981. The urgent threat to Hasankeyf is posed by the Ilısu dam hydroelectric power project which, if implemented as planned, would submerge the site under 65 metres of water by 2018. The Government of Turkey has a vision for salvaging selected monuments and developing the site as a prestigious destination. However, Hasankeyf’s preservation in its original location might prove more economically advantageous than the dam, and its cultural significance for Turkey is incomparable. Today, several dozen people from Dutch, German, Iraqi, Iranian, British and Turkish civil-society organizations are protesting at the headquarters of the Dutch company Bresser in s-Gravendeel, near Rotterdam. 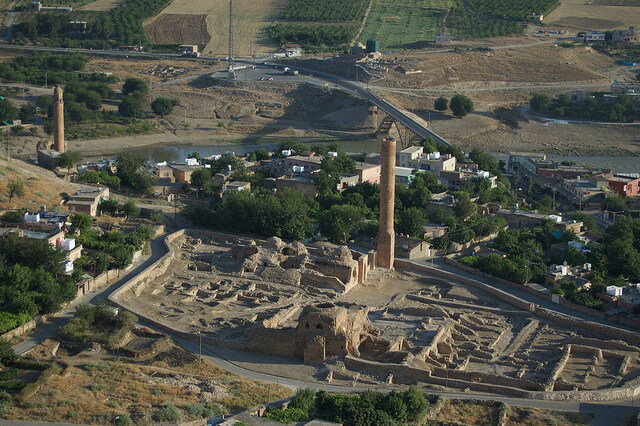 Bresser, which specializes in the relocation of buildings and monuments, is currently moving historical monuments in Hasankeyf, located in the mainly Kurdish-populated South East of Turkey. The relocation is part of the highly controversial Ilısu dam project and we demand from Bresser to put an immediate stop to the relocation of the cultural sites. Hasankeyf is a 12,000-year-old settlement on the Tigris River with unique cultural and natural heritage, and is currently threatened by the construction of the Ilısu Dam. The mega-dam under construction would create, if completed and implemented as planned, a social, cultural and ecological disaster in the region, impacting not only Turkey but the Tigris basin in Iran and Iraq. The local population and Turkish as well as international environmental and human-rights groups vehemently reject the project, which will lead to serious human-rights violations. 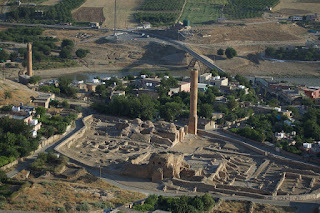 To make way for the dam, a small number of ancient monuments will be relocated outside the planned dam reservoir to a location close to the new settlement of "New-Hasankeyf". Bresser’s involvement was central to the relocation of the 550-year-old and unique tomb of Zeynel Bey in May 2017. And now the Dutch company, together with the Turkish company Er-Bu, is planning the relocation of five further monuments, including the Middle Gate (to the castle), a mausoleum, a bath and a social complex. Works are planned to start in late summer 2017. In a later step, three other monuments (among them the famous El Rizk Mosque) are planned to be relocated. Their relocation would be an unforgivable act of cultural-heritage destruction and a violation of the human rights of the local people, and facilitate far-reaching and irreversible impacts along the Tigris basin. The protestors criticize the uncritical and persistent involvement of Bresser in this project, which is in violation of Turkish law and international conventions. The contracting of the project also took part in secret outside of public scrutiny. The relocation of the Zeynel Bey Tomb is an active violation of the Convention for the Protection of the Architectural Heritage of Europe (CETS 121) which both Turkey and the Netherlands have signed, and also an infringement of the Human Right to Cultural Heritage. Bresser reacted to the coalition’s requests only after the campaign contacted the Dutch government. There was no effort to consult civil-society organizations or the local population impacted by the relocations. Bresser rejects all responsibility, whilst it is clear that without the company’s involvement, it would be almost impossible for the Turkish Er-Bu and the Turkish government to relocate the monuments. Due to the company’s failure to conduct due diligence on human-rights impacts, and the evident lack of respect for human right to culture, a number of civil-society organizations will soon lodge a complaint against Bresser for violation of the OECD Guidelines for multinational enterprises. This protest is not the first and will not be the last call on the company to end its involvement. Already in December 2016, more than 20 Turkish and international organizations signed an open letter calling on Bresser to stop the relocation of the Zeynel Bey Tomb. It is not too late for Bresser to withdraw from the relocation process. If Bresser continues with the relocations, however, the company will be guilty of destroying the oldest cultural heritage in Mesopotamia and make way for a mega-dam that will destroy not only cultural sites but vital biodiversity in the region.